Do you do false lashes? 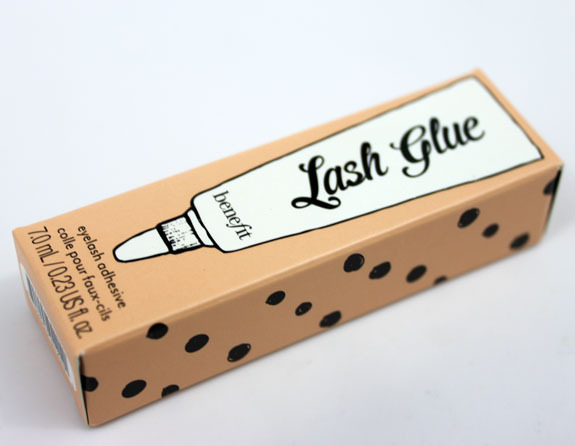 Maybe you will after you see these cute new Lash Lovelies from Benefit. They come in nine different types, all designed to fit precisely and apply easily! Confession: I have never really worn false lashes in my entire life. I think part of it is intimidation and the other sheer laziness. Generally speaking I think these kinds of false lashes should be reserved for nights out on the town, and since I NEVER go out at night anymore, I don’t really have a chance to enjoy them. But maybe YOU will! 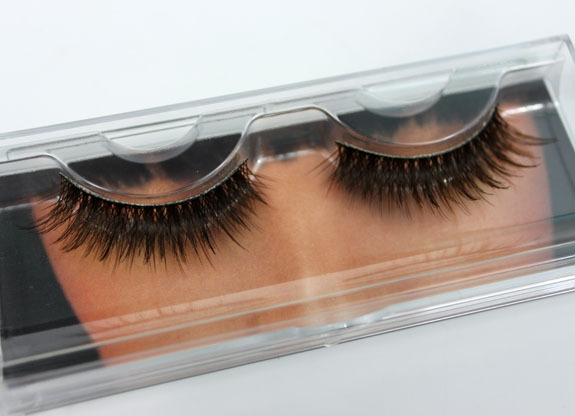 They come in a nice little clear plastic container which you slide out to get to the lashes inside. 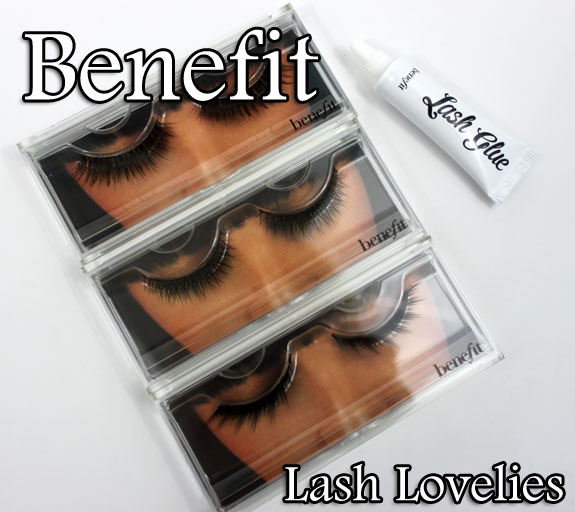 All of these sets are $15.00 each and the Lash Glue is $8.00. Would you wear any of these? How and when would you wear them? Final Day of Vampy Varnish 3rd Bday Giveaway Extravaganza! Big Spender looks great but I am just too cheap to spend that much on them, especially when I only use them for single use fun times. I’m sure they would be great for people that use them daily. They’re nice, but $15 is a lot for false lashes. I suppose these would work for the ladies who wear them often, but I don’t wear them. I use false lashes on models, but I either let them model keep them or throw them away, for sanitary purposes. Yes, I do wear false lashes – I have really blond, thin lashes and then have undergone chemo 6 rounds of, and that pretty much took out what lashes I had that did not show up much anyway even with mascara on them. Pin Up looks sooo gorgeous– full and soft, but not super artificial. They look so natural despite being so fluffy! If they look as good in person as they do in photos, they MIGHT just be worth the price tag. As for the others…I feel like I’ve seen those styles done before and for a lot cheaper. For example, Angel and Debutante look like Ardell Invisibands 102 and 110, respectively. Swatch And Learn´s last post…Blog News: Swatch And Learn Featured on beautylish Again! I love the look of the false lashes. I’m just afraid to try them. I did win a set a long time ago. I still haven’t tried them. So many interesting & pretty lashes. As I fall deeper in the beauty blog world (lol) I am now intrigued to try them! I don’t go out much but since I want to start doing some video reviews I would totally wear them for that. Plus I’m now obsessed with tryout out some pinup/burlesque type looks (yes my husband is thrilled lol) so I think it would be fun to add those lashes! I don’t know how my kids got such gorgeous eyelashes (esp my son) but mine are just ok. 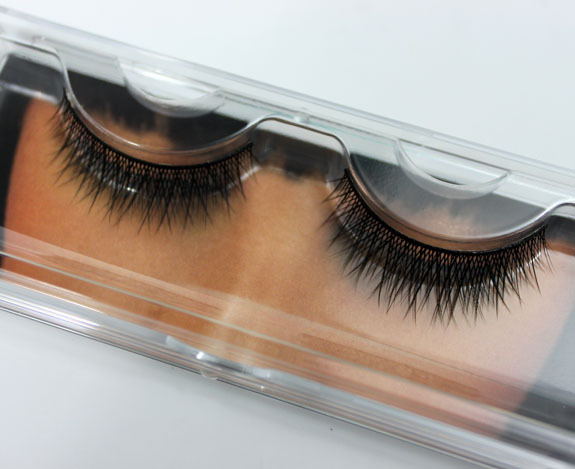 I think I would wear Prima Donna, but I have problems getting the lashes on in just the right spot. They keep slipping and sliding around. I think I would wear them for special occasions, not everyday. 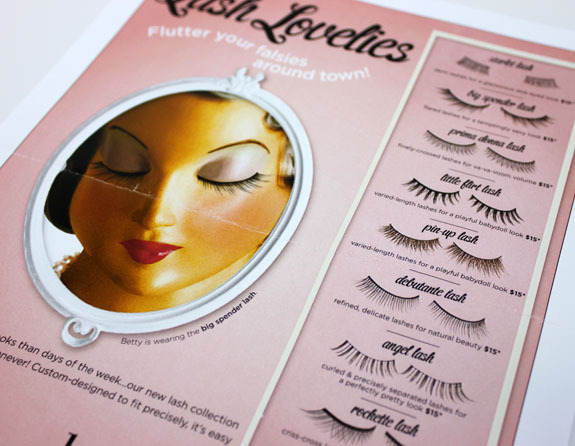 I also agree with some posters that $15 seems to be a lot to spend on false lashes. Hmm…Big Spender caught my eye first. I’d go with that one.